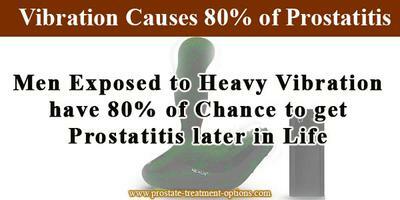 Men Exposed to Heavy Vibration have 80% of Chance to get Prostatitis later in Life. OPINION: I use Michelin tires and my symptoms are greatly reduced. I avoid Lawnmowers and Sanders. They all vibrate. Yes, it is already confirmed that men who are exposed to heavy vibration develop prostatitis in future. This is highly true for those men who drive a truck or those who use large machines, who have higher chances to suffer from prostatitis than others. You have to know that vibrations, especially the powerful one, are able to cause damages not only to your prostate but to almost every organ in your body. For your information, vibration breaks the normal connections between the cells. Indeed, these connections are very important for the organism, because thanks to them, all the cells in the organism are working as one. When these connections are interrupted, the organism feels that something is not ok. For that reason, the organism initiates an inflammatory process, which causes pain, urinary retention and other symptoms. With regards to the brand of the tires, it is thought that most probably the brand determines the vibrations. Besides this, according to the opinion of the specialists, Michelin are one of the best tires on the market. Furthermore, the suspension, the rims and the pressure in the tires are also important to determine the vibrations. The specialists advise to drive your car/truck with low pressure in the tires if you are having problems of this kind and if it is possible for you to do so. the excessive vibrations and they are not going to harm your prostate gland. You have to know that if your rims are not perfectly round, they cause more vibration than usual. These vibrations are able to harm you. It is important for you to know that prostatitis is not the only one condition observed in men exposed to a lot of vibrations. Hemorrhoids are also present more frequently, and very painful in these patients. I, now, use only MICHELIN and have helped many people who would listen- I make sure all rims are round and free of wobbles-I just had my VW Van rims re-machined to remove any slight wobbles. two- My Nissan Maxima, shod with Michelins, requires only tiny wheel weights-Or none- That Car/tyre combination has never caused me a problem. I avoid heavy use of power tools and Weedeaters. I have never met a doctor who could cure Prostatitis-Or even offer a treatment-DMSO( 75% ) and sitting on A hot water bottle full of chilled radiator coolant is my answer.